Why is one hand held behind the back? Although the course participants know the applications of almost all the patterns in their special sets, there are a few they still may not know, or which they would like to know their finer points. They grasp this rare opportunity to ask Grandmaster Wong. The Butterfly Palms, for example, is often heard of in Shaolin Kungfu, but seldom understood. Grandmaster Wong reveals their secrets as well as demonstrate how the Butterfly Palms may be used against an opponent irrespective of how he responds! The finer points of “Old Tree with Roots” and “Thousands Tons Towards Ground” are also explained. Grandmaster Wong demonstrates a combat application of the Pa Kua Palms and the Butterfly Palms against a strike. The Butterfly Palms can also be used effective to release a grip and then to counter-strike. The Butterfly Palms are famous in Shaolin Kungfu, but not many people understand their combat applications. Here Grandmaster Wong reveals some of the secrets of the Butterfly Palms. The size of the video clip is 0.77 mb. A Shaolin master may use just the Butterfly Palms, and nothing else, on you. If you attack you, the master counters with Butterfly Palms. If you tries to defend against his attack, he continue attacking you with Butterfly Palms. Is this possible? The size of the video clip is 1.10 mb. Zhang Wuji asks Grandmaster Wong about the combat application of the pattern “Old Tree with Roots”, which is from the Tiger-Crane Set Please note the difference from another pattern called “Fell Tree with Roots”, though both are basically felling techniques. Grandmaster Wong explains the finer point in the combat application of the pattern “Thousand Tons Towards the Ground”. 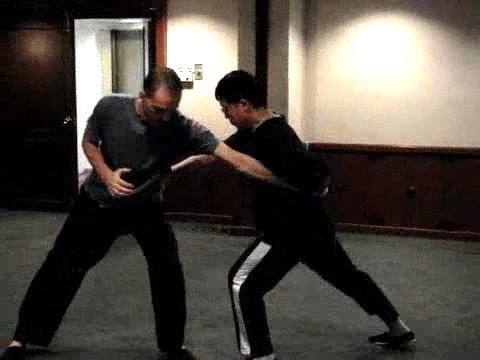 With these finer points, the exponent not only prevents himself from possible counter-attacks, but also breaks the opponent's elbow or arm besides striking him. Revealing the Secrets of Shaolin Masters from Wong Kiew Kit on Vimeo.